If you have ever been to the gym and seen a personal trainer, the interaction with Clients appears rather perfunctory. Frequently, outward appearances denote simply counting on one machine or exercise followed by other activities in the circuit. For successful "Client/Trainer" relationships, there is much more at play. 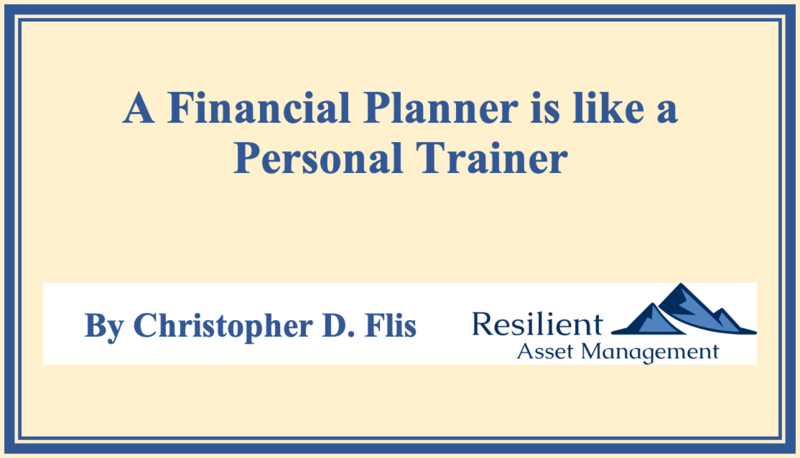 The parallels are many between personal trainers and financial planners. While some of these attributes and outcomes may seem obvious, putting an 'X' in the box for each of them can be anything but. While some can tackle these things individually, clearly not everyone can. Thus, the existence of the fitness industry. It is not a stretch to say that most people know about what they need to do - be it with their money or their fitness. However, sometimes it is best to seek the help of a professional. Leaving aside the professional expertise gained, Accountability is seriously in play as well. As you can see, the more specific you get to your goals, the more likely you are to accomplish them. Moreover, when you involve another person in the loop - I've not heard of how AI does here - the likelihood approaches 100%. For a specific military example, there is the semi-annual Physical Readiness Test (PRT). Before doing anything physical, weigh-ins are completed. While some can talk about diet, fitness, workout routines, theories, or whatever, the scale is the scale - like your dress uniform, it doesn't lie. Simply knowing one has to report and have a 3rd Party operate the scale is motivation in itself. If you commit to an annual physical examination where vital signs (Blood Pressure, Pulse, etc.) and blood work (Cholesterol and others) are checked, you can get the same effect. Clearly, accountability is a powerful force. For those choosing to work with a Financial Planner, the benefits are frequently similar. I was not involved in the profession long before I heard in a follow-up Client meeting something to the effect of, "We were going to buy it, then we realized we would have to tell Chris and we knew you would not be happy." With tongue in cheek, I call that "branding". Seriously though, simply having to report to someone on your behavior is a powerful and real thing. If your finances have left you feeling somewhat out of control, a good Financial Planner ought to be able to introduce accountability into your situation, which can change outcomes dramatically. Even for those who have tackled restraint with their spending, there is frequently a knowledge gap about their finances. For example, according to Pew Research, 1 in 5 people do not contribute enough to their 401(k) Plan to receive the Employer Match. Effectively, this is "free money"...a reputable Financial Planner is likely to want to close this gap in a Client's financial plan. Additionally, the rules for Charitable Giving were seriously impacted by the Tax Cuts and Jobs Act of 2017. You can read about the specifics here. My point is that just as a Personal Trainer can guide you through the nuances of progressing from the beginning stages of a fitness regime to expert status, so too can a Financial Planner take your finances from good to great to superlative. There are numerous other examples....a competent Financial Planner is always learning, always asking, always comparing and always revising recommendations to better Client Outcomes. When you partner with a Financial Planner, particularly if he/she is a Fiduciary, you should be adding to the professional expertise in your life. While not perhaps equally on par with accountability, this too can have numerous financial benefits for you. Develop an Executable Budget. Accurately assess your expenses and account for ALL of them. Beyond these pillars, you can tailor a customized plan to achieve your specific goals - legacy planning, charitable giving, and travel goal are common examples. Once you and your Financial Planner have identified where you are trying to go, your Planner should craft a plan to get you there. Then, and most importantly, he/she should fly right seat with you every step of the journey. Plans change, life happens, and obstacles must be overcome - this is when your Financial Planner will earn his/her fees. Given the fees paid for the services provided, it is certainly understandable that Clients would want value delivered for the fees paid. Vanguard attempted to tackle this question here. Interestingly, one might think the value proposition centered around portfolio construction - this is incorrect. Rather, the area where good Financial Planners deliver the most value is in Behavioral Coaching - nearly 50% of all the value (1.5% of the estimated 3% Overall Benefit). The runner-up was in the technical work surrounding the withdrawal order from various accounts. While these findings may seem ironic, they are anything but. Financial Planners should be assisting Clients in the areas where they need the most help. In an era of near ubiquitous investment offerings - and at rock-bottom fees (Thank You Vanguard) - investments are not the area where the best assistance is rendered. Rather, Financial Planners make bigger impact by modifying Client financial behavior. Specifically, Financial Planners influence their Clients to consistently contribute to their various investment accounts - 401(k), TSP, IRAs, and others. Additionally, Financial Planners also keep Clients from making inadvisable financial decisions. For example, Staying the Course during extreme market volatility...there are countless others - think opening a restaurant with all your life savings. So, if you find yourself feeling helpless financially, perhaps a Financial Planner is for you. Many professionals in the field specialize into very specific niches - I've actually met one who only worked with Cross-Fit gym owners. Google is your friend here - it has never been easier to find a customized and affordable Financial Planner. If you would like to leave comments on this article or would like to discuss your personal situation, please contact us.